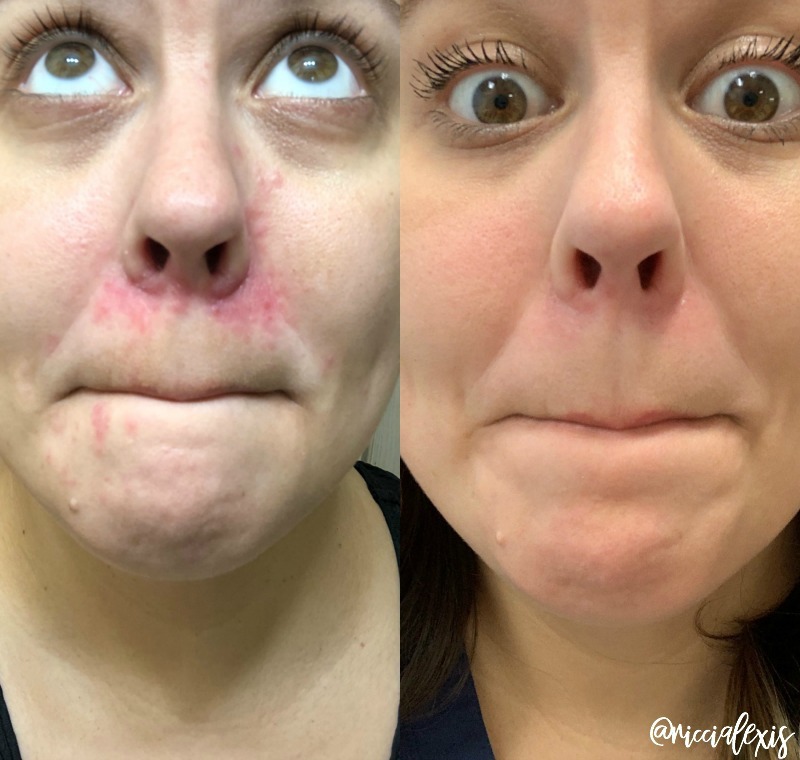 I have written quite a bit about about my struggles with Perioral Dermatitis recently…including an update last week that had some pretty amazing before and after pics if I do day so myself. 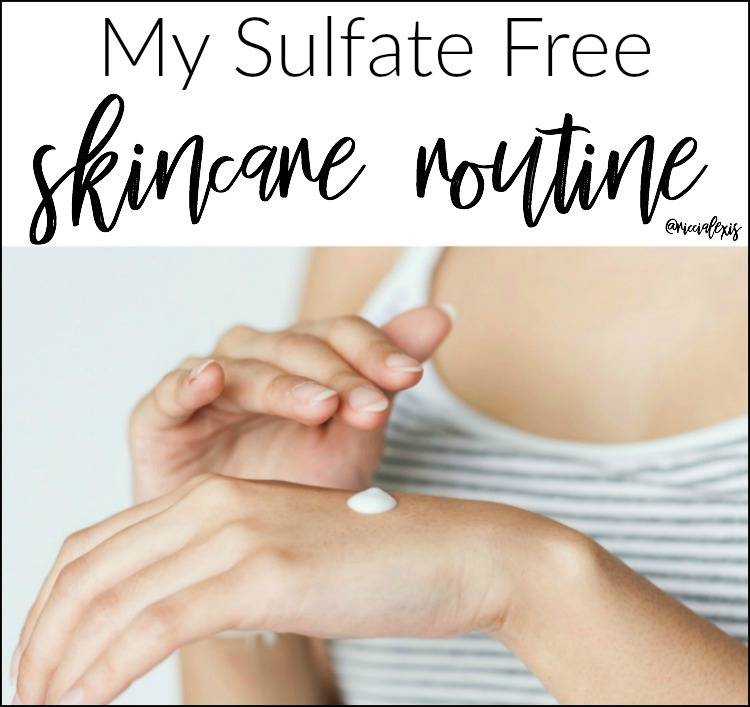 Since that post I have gotten soooo many questions about exactly what I’ve been using on my skin so today is finally the day I’m going to share my sulfate free skincare routine with you!! This is the pic I posted…see the difference??!! After my official Perioral Dermatitis diagnosis last fall I decided to revamp my entire skincare routine. One of the possible causes of PD is SLS (sodium lauryl sulfate) and so I decided to get rid of everything I had with SLS and that included skincare, makeup and even hair care. SLS is a foaming agent and you would be surprised how many things in your home have it! I am proud to say I am sulfate free in all of my beauty products now! Enough rambling, let’s get to it! I am posting about both AM and PM products and will specify when I use each product. Or actually, if I don’t specifically say AM or PM then it’s safe to assume I use it both at night and in the mornings. ONE. 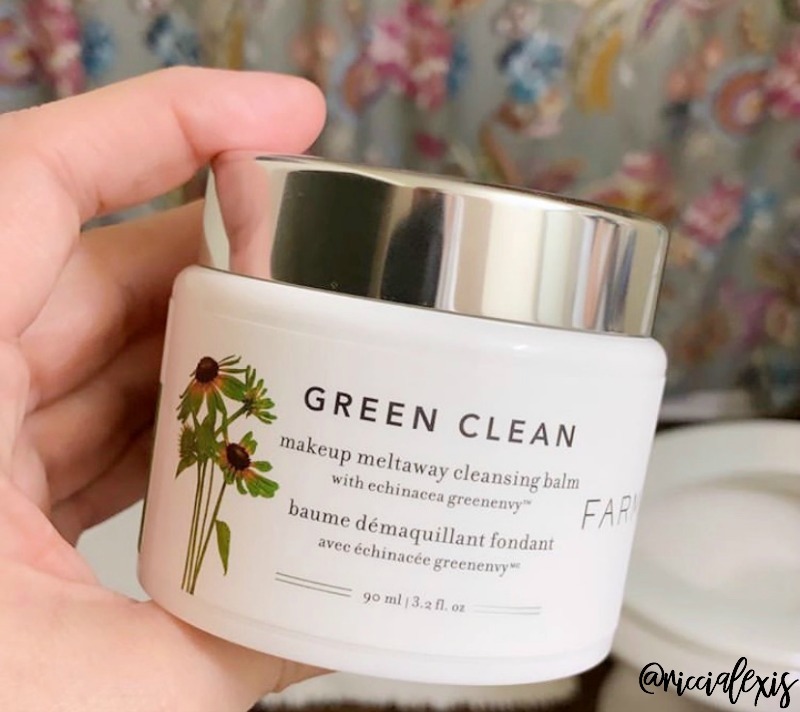 Farmacy Green Clean Makeup Meltaway Cleansing Balm. I am a huge fan of cleansing balms and love this balm to oil formula in the first step of my double cleansing routine. I love how gentle this balm is and yet it still manages to get off every bit of mascara I use without damaging my eyelashes. I also love that it’s non-toxic and cruelty free! TWO. 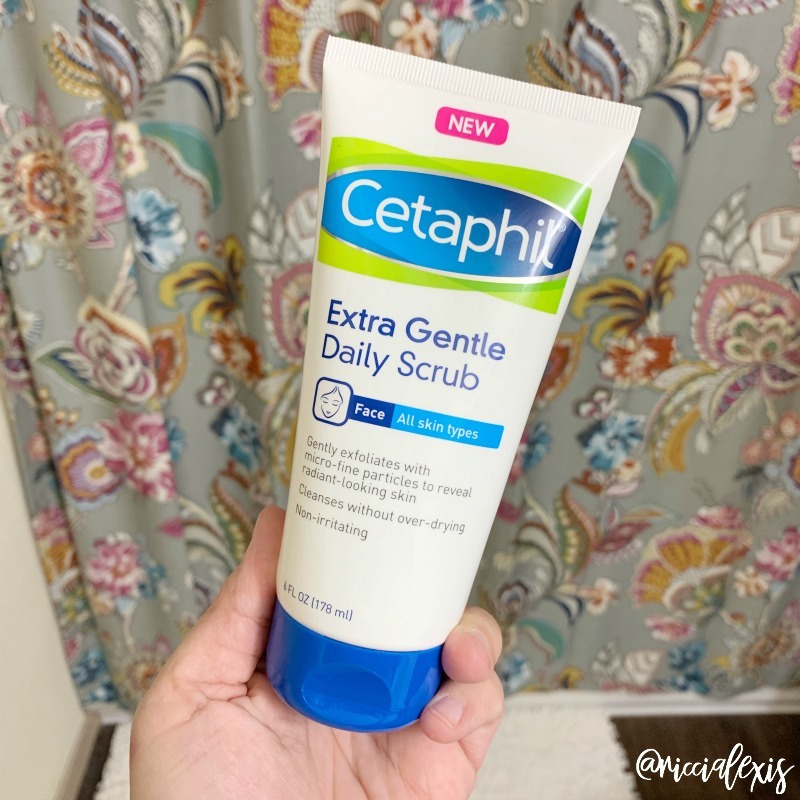 Cetaphil Extra Gentle Daily Scrub. I am not normally a fan of using an exfoliating face wash every single day but trust me when I say this one is gentle enough to use daily and I really feel like it gets my face super clean! Plus it’s sulfate free! THREE. Clinique Clarifying Lotion. This toner has been my ride or die for at least the past twenty years. This was the very first toner I ever used and it is the BEST. I have tried switching to a natural toner but all of the ones I tried made my skin feel sticky and that’s not good so I am back to using this one. RIDE OR DIE. FOUR. 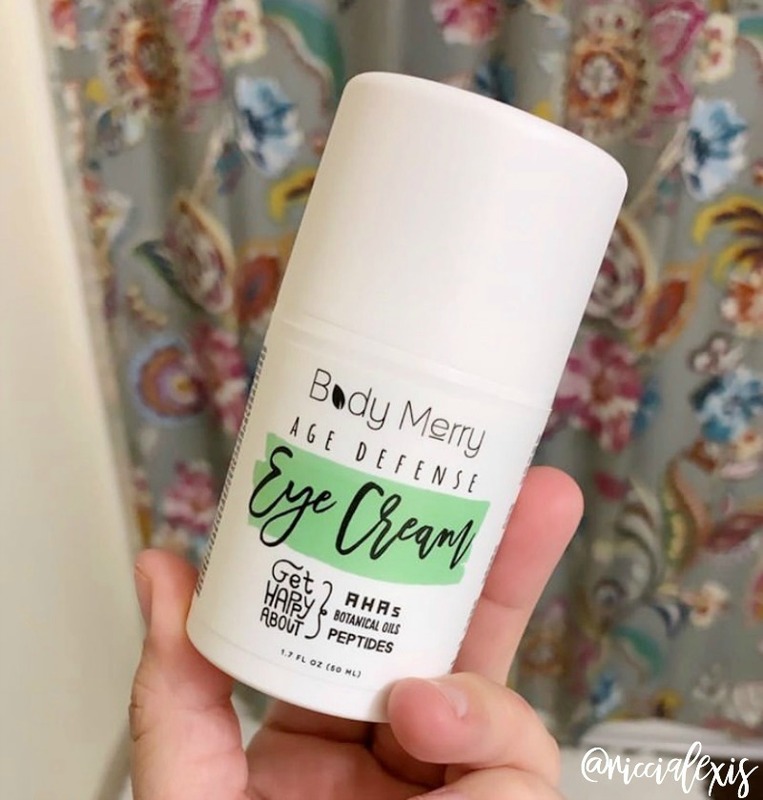 Body Merry Eye Cream. I am always on the lookout for a good eye cream, especially since switching back to night shift almost two years ago. I feel like my eyes are always puffy and have super dark circles so I decided to give this eye cream I found on Amazon (with great reviews) a whirl and so far I really love it. It’s packed with good for your skin ingredients like Organic Rosehip Oil & Vitamins B5 + C + E and more! FIVE. 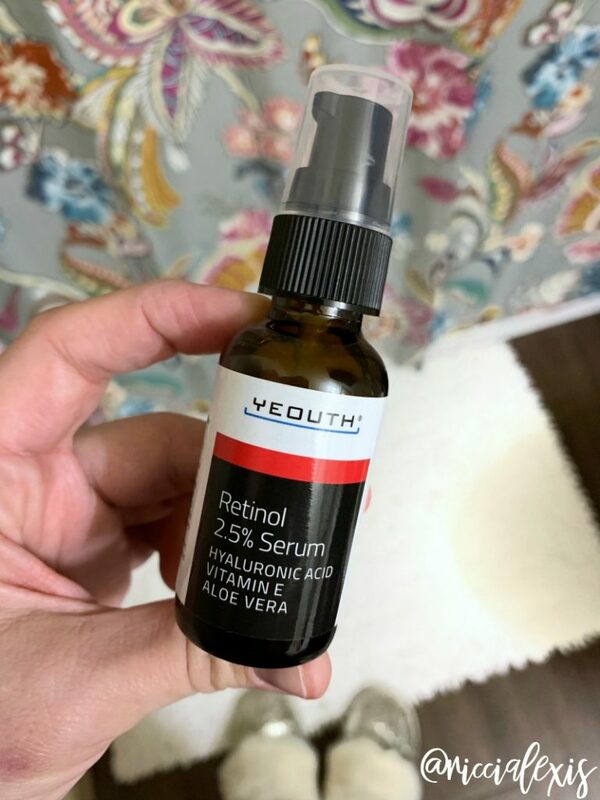 Yeouth Retinol 2.5% Serum. I have recently gotten into retinols and after a lot of research I finally decided to try this one. This serum is packed full of hyaluronic acid, vitamin e and aloe vera to help reduce fine lines, tighten pores, hydrate and moisturize, and soothe and repair skin. I use this product at NIGHT TIME only and I swear my skin is looking a little tighter! SIX. 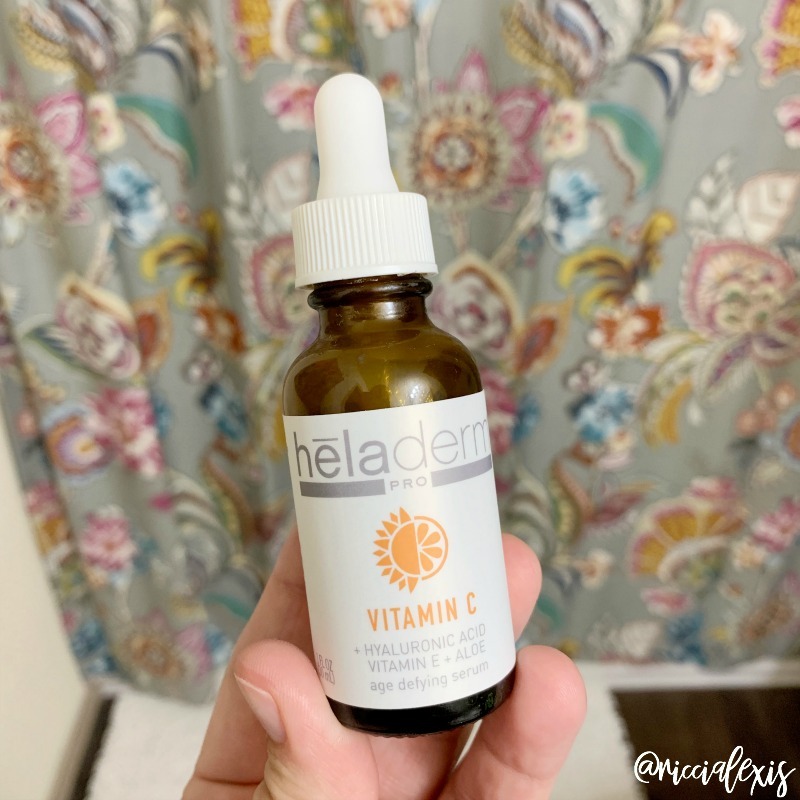 Heladerm Vitamin C Serum. I started using this serum a few weeks ago and my skin LOVES it!! I use this serum during the DAY TIME and it is packed full of vitamin c, hyaluronic acid (see a trend here?? ), vitamin e, and aloe vera. It is super soothing and gives my skin a little boost. I feel like my skin is literally glowing after I use this serum! SEVEN. 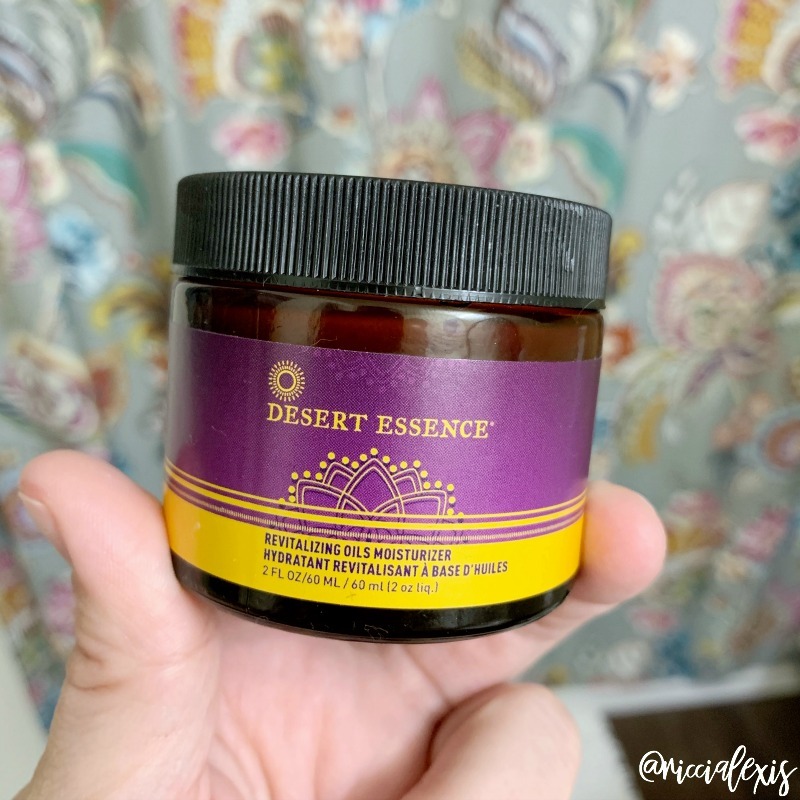 Desert Essence Revitalizing Oils Moisturizer. This is the moisturizer is use at NIGHT TIME and I love it because it is a little heavier than what I use during the day but not super heavy because I can’t stand the feel of anything on my face. I’m weird, I know. This moisturizer also contains Argan, Evening Primrose, and Avocado oils. Also- Desert Essence products do NOT contain any Artificial Fragrances/Dyes, SLS, PEGS, PPG, MEA, DEA. Parabens, Glycols, or Phthalates. WIN. EIGHT. 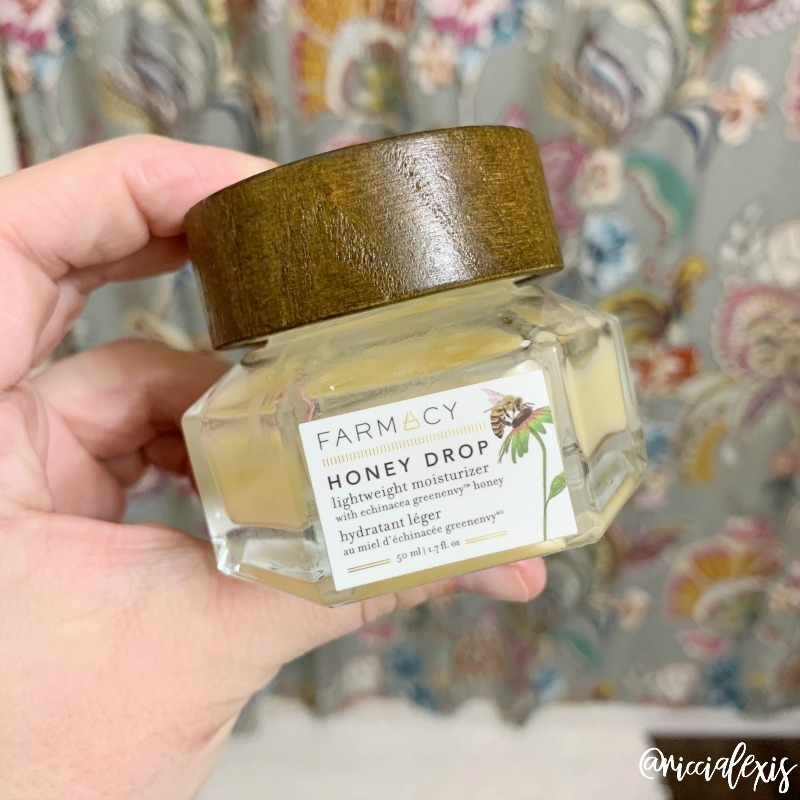 Farmacy Honey Drop Lightweight Moisturizer. I love love love this super lightweight moisturizer for DAY TIME use. It plumps, nourishes and hydrates skin with a triple hyaluronic acid complex and six natural superfoods, including our antioxidant-rich Echinacea GreenEnvy™ honey. Talk about a good for your skin product, this moisturizer is AMAZING!!! And that’s it friends…my updated sulfate free skincare routine.A few things that I feel need mentioning are that skincare is not the only thing that cleared my skin up. I was also on prescription creams and an oral antibiotic that helped clear up my Perioral Dermatitis. I also went makeup free (except for brows and mascara) for five months and I know that helped a LOT and if I’m being completely honest with you I don’t plan on wearing a ton of makeup from here on out. Naked face…mascara and brows only! I have said it before and I will preach it until the day I die but having a good skincare routine is so much better than piling a ton of makeup and hoping for the best. If you have a good skincare routine then your skin will be clear and even and then you won’t have to wear a full face of makeup everyday and then your skin will be able to breathe and you will feel so much better! I promise! I used to wear makeup every single day and I cried at the thought of having to go makeup free while I was treating my Perioral Dermatitis. I was so used to wearing a full face of makeup everyday and it was so weird to go without it but I eventually got used to it and now I’m embracing it. It’s so freeing y’all!! Trust the process!! Plus it makes getting ready to go in the mornings so much easier! HA! If you don’t have a good skincare routine I highly encourage you to get in the habit. Your skin will thank you. Do you have a good skincare routine?? Do you use sulfate free products?? I have always wanted to try Clinique products but have never purchased them. Thank you for sharing this skincare routine. I have been using the same one for years. 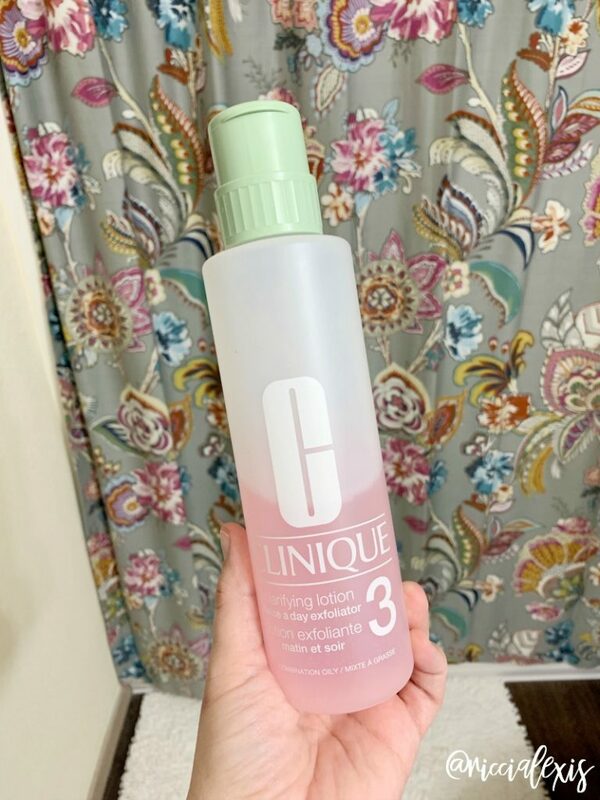 That Clinique toner is the same toner I’ve used since I was a teenager! I love it! I have NO skin care routine. I clean at night with wipes and don’t use moisturizers (I know I should.) Are you shuddering yet? I am going to give a couple of your items a go right now. I needed this push, so thanks! I didn’t get my skincare together until a few years ago so I’m not shuddering at all!! Getting started with a skincare routine can be intimidating and time consuming and I get it!! LOL!! That eye cream ROCKS. It has already brightened my face so much! I have a pretty good skin care routine going on right now and like how it is working. Actually tried some of these products listed. You skin looks great! I really need to have more of a routine with my skin. It could really use the help. I’ll have to try these products out. It’s hard getting a skincare routine together but when you figure out what works for your skin it can be life changing!! I am so glad that you found something that works for you. I’m going to tell a friend of mine about this because she has the same kind of problem you do. And I think she could definitely learn a lot from your post. Thank you!! And tell your friend that if she has any questions she can always email me! omg love that you found something that actually works for you- it looks great girl- ill be sharing w/ my friend bc she suffers from the same thing. Thanks girl!! And thanks for sharing with your friend! If she has any questions or just wants to talk/vent tell her she can always email me! I don’t have a skincare routine at all. I don’t wear makeup, either, but I have good skin and it’s just there so I figure that if it’s not doing anything to bother me I should just leave well enough alone LOL. LOL!! Girl you crack me up!! I used to not do much to mine either but then my Grandmother reminded me that we only get one chance and it’s better to prevent than repair! I love cleansing balms too. I’m about out of my current balm so I need to try the one you’re recommending. I love that it’s non-toxic and cruelty-free. Farmacy is an AMAZING brand!! Sulfate free is the way to be. I never realized how many of my favorite skin and hair care products contained sulfate. Your skin looks amazing. Me either!! Even my favorite toothpaste has it! Oh wow! Your skin looks so great! I can’t believe that transformation. Thank you! It was sooo bad!! Yuck!! What some great products it seems like you have in your routine! I love that there are so many different brands out there who have decided to ditch the SLS to let us have more healthy skincare. Me too!! And there are more brands going sulfate and cruelty free every day! First of all you are so cute! Secondly….my daughter and I both are always looking for great skincare products and I see a few in the list to try. Your results are amazing! I definitely agree that a good skin care routine is key and much better than just covering with make up! Wow I can’t believe your B&A photos! That’s amazing! It’s so funny that you mentioned the cleansing balm first. I’ve heard so many good things about that product, I can’t wait to get my hands on it! I LOVE a good cleansing balm! They are amazing at literally melting the makeup off your face, especially stubborn mascara!! And thank you!! 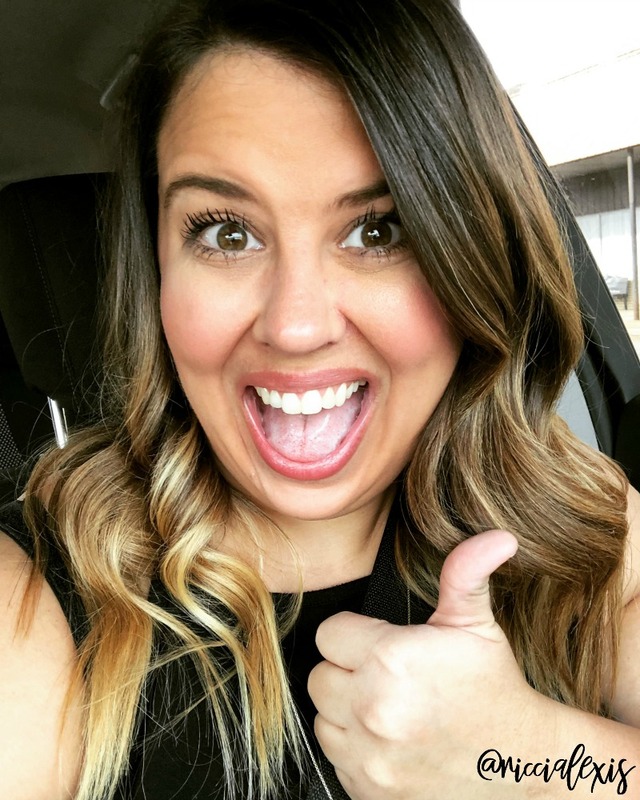 Girl your skin story is so amazing! I’m so glad that everything is better for you now!!! Thank you!! I am so glad my skin is finally clear and even better than before! Now I just need to maintain it…HA! I love learning about other’s skincare routine. I’m still trying to figure mine out. It took me a while to figure out what my skin needed! I hope you get your routine down soon! Farmacy is an AMAZING brand that is cruelty free! Some other great budget friendly brands that are also cruelty free are Derma E, Desert Essence, Acure Organics, and Kiss My Face! What an improvement, I have been meaning to try cetaphil and retinol. But I am scared of getting burns from the retinol so I guess I will start with the lowest percentage because my skin is really sensitive. Your skin looks great and I love the result, I need to try all of it I’ll check it out all the product and brand. I have tried cetaphil before and it worked great on my skin as well. I love how it made a big difference on your skin. My eyes have dark circles too, but I have never really thought of using an eye cream. I make sure not to miss washing my face and putting on moisturizer every single day though. I will have to check that eye cream out. I love Clinique. Their cleansing items are some of the best. It is so important to find a skincare routine that works for you. Great read! Thats always where I get red too. I should probably check my products for SLS also! It’s in everything!! There are so may products I want to try but they all have sulfate in them. Dang it. I need to check it into these products, my skin gets dry and starts itching. That will create burns after that. Your skin looks really beautiful. Burns are no good! Fingers crossed you find something that works for you!